Here is my entry for the Great Peanut Butter Exhibition #2 – Breakfast. Never had cornbread for breakfast? You’re missing out. A nice toasted piece of cornbread spread with some butter and drizzled with honey is a wonderful breakfast or snack. I came up with this gem one evening when a strong urge for cornbread came over me. I didn’t have the ingredients on hand, but I carefully planned it out for the following day. 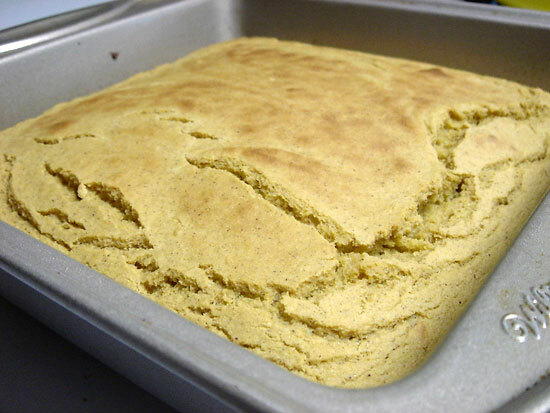 I scoped out several cornbread recipes, including one where masa harina was accidentally used instead of cornmeal. As for the peanut butter contribution, the only recipe I found for peanut butter cornbread called for 12 slices of bacon which seemed a bit odd. In any case, I came up with my own recipe. I took that out, added some of this, increased this and that and voilà! The result was a corny, crumbly and peanut buttery cake – exactly what I was looking for! The only downside was that it was a bit dry. This was most likely due to the masa harina, so the liquid has been increased to 1 3/4 cups to account for that. It’s best right out of the oven, but it’s just as good toasted with honey. This recipe is vegan if you use soymilk and gluten-free if you substitute a different flour for the whole wheat pastry flour (or use only masa harina/cornmeal). Don’t forget about the Great Peanut Butter Exhibition #2 – Breakfast! The deadline is this coming Friday, May 30th at Noon PST and we’ve only got 3 entries so far, so let’s move it! 1. Preheat oven to 425 degrees. Mix dry ingredients (first four) together in a large bowl. Whisk wet ingredients (last 3) together in a medium bowl. Pour wet ingredients into dry ingredients and mix well. Pour into a skillet or 8×8″ pan coated in cooking spray and bake for 20 minutes, or until a toothpick comes out clean and top begins to brown. Remove from pan to cool, if possible. From what I hear masa harina requires more liquid than cornmeal, so if you use cornmeal reduce milk to 1 1/2 cups. I only used 1 1/2 cups milk with masa harina, but that’s because I did something special with it I shall reveal soon =). Peanut Butter Cornbread? I’ve never thought of that before! Sounds like a great combination! I so want to play, but the people that sign my paycheck are actually expecting me to earn it. The cheek! I’ll be checking out the recipes tho’. why not, eh? I need to try it asap. But anyways, that cornbread variation, with the peanut butter sounds quite delish! A fun way to start the day, for sure. You know, I would never have thought of using peanut butter in a cornb read recipe, but I can’t think of a reason why it wouldn’t work… it looks fantastic, actually! Adding a little bacon into the cornbread actually sounds really good. A little saltiness with the added smooth texture of the peanut butter would make for a wonderful big breakfast. Looks delicious! Do they have cornmeal and masa harina at any grocery store? Have you tried the white chocolate peanut butter from peanut butter company? that stuff is amazing!!!!!!!!!!! A peanut butter corn bread sounds really interesting. Sounds great! I just made corn muffins. I made this as soon as I saw it on your site. Peanut butter in cornbread…you can’t go wrong with that. It was amazing, even with the gluten-free subs that I made (millet flour for the regular). Thanks for the recipe! and ur still making me sick over here. i love it! how about some apple sauce to minimize the dryness, instead of more water. i need to spend a whole month making your concoctions! Mmmm… That looks so yummy. 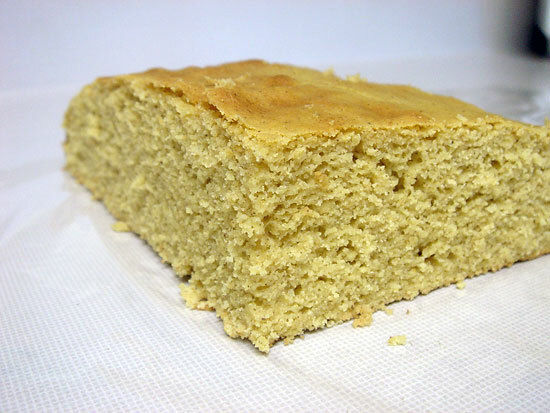 I love cornbread for breakfast, its always been a christmas morning tradition. This version especially looks to die for. Woahie wowie, that looks amazing! What a great idea. The ingredients seem healthy too… I will definitely try that. This sounds very tempting, I will have to try it soon. This week probably. Once, I added peanut butter to a batch of dough in my bread maker and used it for a grilled chicken sandwiches. Honey mustard or mayo along with lettuce worked well with it. I added it before the yeast and wet ingredients if I remember right. It has been a while and I have been meaning to make it again. I suppose it is a rather unique combo, but it sounded really good in my head. It also tasted really good =). Amanda, I suppose the bacon actually would have been a good addition, and it would have made Elvis proud. Sagan Morrow, cornmeal should be available at any grocery store, but masa harina might be a little more difficult to find. As I understand it, cornmeal is degerminated corn whereas masa harina is not. This makes masa harina a little higher in fiber and more nutritious. It also probably explains why it is drier. Daisy, I have! But I’m not so much a white chocolate fan. You can easily make your own actually, just check out my Dark Chocolate Peanut Butter post. I mention it there, but you can use any kind of chocolate (including white) to make it easily at home! healthyceliac, I’m glad it worked out for ya! You probably don’t even need to substitute anything for the whole wheat flour, I bet you can use all cornmeal or masa harina if you wanted. Joe G., Yea, peanut butter and chicken go together really well. And honey mustard? That’s my absolute favorite condiment of all time, I’ll put it on or in anything! Interesting that it worked by just adding it to the machine. Would I be a crazy person to put peanut butter chips and chocolate chips in this recipe? Trying to make something like reese’s peanut butter cups in cornbread form…. Give it a shot – it can’t be THAT bad, right? Think about it like this….cornbread muffins are delicious. cornbread muffins with chocolate chips – also probably delicious, right? What about with chocolate AND peanut butter chips? By extension, they HAVE to be good!